Since its foundation in 2005, thousands of participants have continued their education with HOFA-College correspondence courses. At this point I would like to congratulate you on the amazing HOFA-College. What you offer and how you implement it is great! For me as an autodidact in the field of audio engineering and audio production, your courses are a great benefit. The material is presented in a very descriptive and comprehensible way, the exercises with the corresponding audio examples are eye-opening and the mix analyses cannot be outweighed with gold. Each submitted mix is dissected down to the smallest detail, evaluated honestly and objectively and you always get suggestions on how to improve your mix. In addition, there’s the online campus and the workshops. The combination is what makes it so great! I’m well prepared for my future work as a sound engineer in a theatre, as many relevant topics (e.g. the preparation of a production, miking of instruments, analytical listening, working with a console, room acoustics, etc.) are covered in great detail. I can only advise anyone who is interested to take your courses. You really get better and you learn a lot on your way. I’m very satisfied with HOFA-College, you’re doing a great job! The learning content is fantastic, I have never seen such competently written texts anywhere else! As a blind student I have to say that I think it’s great how open you are to the topic and how hard you work to guarantee the accessibility of the materials! […] learning with you doesn’t feel like school at all, but rather like an extension of knowledge and skills as an audio engineer and an exchange between beginners and professionals! I would like to thank all tutors and other employees at HOFA-College and I’m looking forward to the contents in HOFA PRO! Composers are often confronted with the fact that budgets are being cut and productions need to be finished as fast as possible. 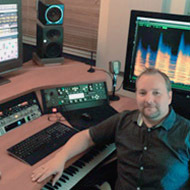 For this, the producers often want to get perfect mixes at an early stage of the production. There’s no time and money to go to the studio and mix the finished productions, let alone make countless corrections. So you inevitably become a one-man show. What now? Learning to mix myself seemed a bit bold to me, despite a lot of studio experience as a composer and musician. That’s when I discovered HOFA. This was the best thing that could have happened to me! The HOFA PRO course is a fantastic offer for all those who already have some basic knowledge and want to get their audio engineering know-how to a professional level – whether they do it for fun or because of professional reasons. In addition to the extremely detailed analyses of the practice mixes, the written material and tutorials on the online campus form a truly comprehensive course. But what I didn’t expect was that I’d discover a passion for mixing and audio engineering. That was a real gift! The people at HOFA are increadibly nice as well! All I can say is: thank you so much, it was great! The course is super easy to handle. I will happily recommend it. I’d like to thank you very much. I learned a lot and it was a lot of fun. I enjoyed the great structure of the learning units. Everything was well explained and demonstrated. The constructive criticism was very helpful and motivated me a lot. As a musician and music teacher, I was already able to recognise and understand music and musical intentions. I learned how to use my knowledge in a mix from you guys. Thank you very much! I’m full of praise when it comes to the HOFA COMPLETE course. It’s the best course material, didactically well explained, accurate and specific examples, punctual, inexpensive and highly competent. I got to know the employees and they are very friendly, flexible and well organised. Here’s a tip for new students: “take acoustics seriously! I underestimated that in the beginning – you’ll be surprised”. I can’t recommend HOFA enough. I have attended your BASIC course in the past 6 months and I’m very satisfied with the course contents and your support. It was great fun to take on your mixing exercises and to learn and understand a little more each time thanks to your helpful analyses. It has become clear to me that you can’t do without these basics and that you first have to develop a certain level of expertise in audio engineering. For me as a hobby musician, this is a fascinating topic that is worth focusing on. And I can only recommend one of your courses to anyone else who is interested. The greatest thing about your course is that I got to mix music that I don’t normally listen to. This gave me some insight into the composition and challenges of other genres and enabled me to open up my horizons. Hi, my name is Janos Gange and I’m a self-employed beat producers. The course material is really good and I have to say that HOFA-College is great. The course content was explained in great detail. The HOFA team is very friendly and if I didn’t understand a topic, I could ask them tons of questions. The answers were always very meticulous. I learned a lot from HOFA and I’m very happy that I can call myself HOFA Audio Engineer now. I can recommend the HOFA-College to everyone – the entire HOFA course is amazing. The HOFA PRO correspondence course has given me the opportunity to improve my hobby significantly through professional training. There are 12 learning units, all of which are amazingly designed. You not only learn how to do things (e.g. miking an amp), but also why. I think that the “why” is just as important as the “how”, so that you understand the whole topic. In addition, there were extensive audio examples for each topic, so you could immediately try out or clarify what you had just learned. At the end of each lesson there were two songs, one of which you could mix and get feedback for. At first I thought I’d receive two or three pages of feedback – I was wrong! I received up to eight pages of feedback for some lessons. You get the feedback from two tutors that analyse the track together. (I always mixed both songs, but only submitted one – practice makes perfect). The online campus is also a highlight! You get high quality videos every month (I think there were over 100 of them). The videos clarified the contents of the texts through the visual and audible impression. The price for the correspondence course is about 100€ per month: you get 2 complete studio productions that you can mix yourself, one of which is analysed in detail (two tutors work on it for at least 2 hours), several HOFA Online Campus videos and about 80 pages of text for each month. The time management is completely up to you. While you have to fulfill your workload every month, you can decide for yourself when to do it. If you consult the tutors because you have to submit a mix at a later time, it’s no problem at all. HOFA was one of the best decisions I ever made – I can recommend HOFA to everyone who wants to pursue a hobby professionally and wants to get first hand information!